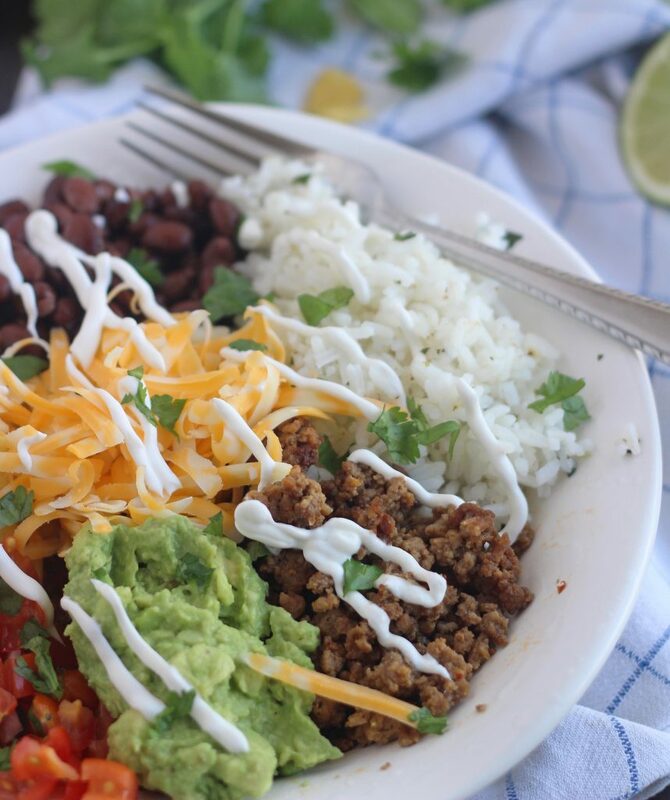 These Smoky Ground Beef Burrito Bowls are packed with flavor and the perfect meal for even your pickiest eaters. You guys, I’ve been watching the Winter Olympics and can’t even believe how crazy and talented these athletes are. The figure skating has always been my favorite to watch. I can’t even stand on ice skates and keep my balance (lol!). How in the world can they do triple salchows, quadruple lutz’ and triple toe loops? And then there’s the downhill skiing where they’re going crazy fast, and the flips, jumps and twists the skiers and snowboarders do. I get so nervous watching them. 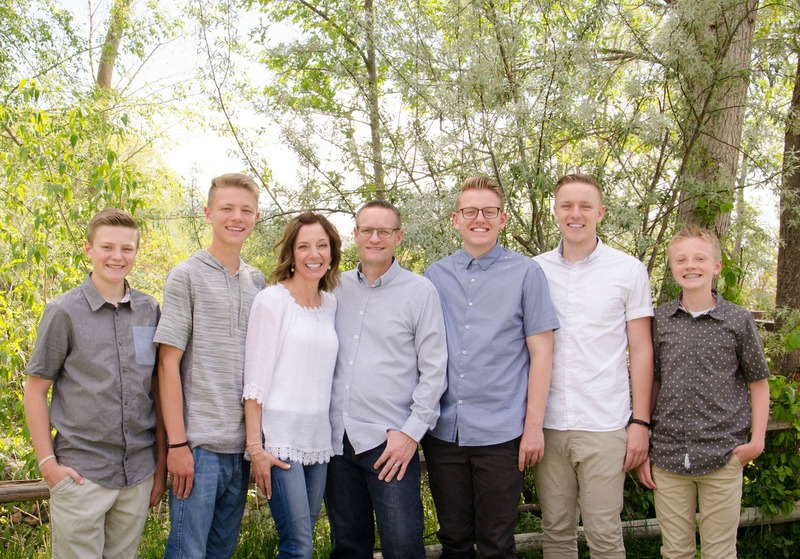 My boys just laugh at me. So it’s not surprising that during all the nerve-racking events, I’m over in my kitchen baking cookies and watching from a distance. Because you know, that makes it less stressful. Anyway, give me one of these Smoky Ground Beef Burrito Bowls and I’m good & calm. Oh man do we love these! 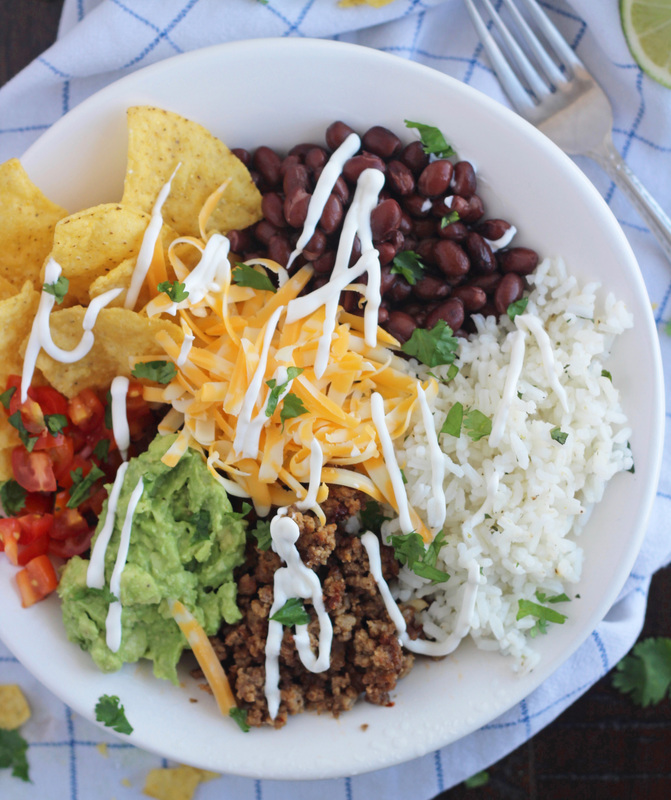 The great thing about these burrito bowls is they’re so versatile. My pickier boys just leave off all the stuff they don’t like (which just leaves more of the yummy stuff for us non-picky eaters). These are fresh, delicious and packed with so many flavors. The smokiness from the paprika and chipotle pepper gives the meat the best flavor. You can simplify these even more by using store bought salsa and guacamole. I’ve included in recipe notes how I quickly throw guac and pico together if you want to make your own. In a large skillet cook ground beef until browned, breaking up meat with a wooden spoon. Drain any grease. Add cumin, smoked paprika, salt, pepper, chopped chipotle pepper and water. Stir well and then add in cheese and mix until cheese is melted. Combine cooked rice, lime juice, zest and salt. Stir in cilantro just before serving. To a bowl, add a large spoonful of cilantro rice, beef filling, black beans pico de gallo, guacamole, cheddar, and a handful of broken tortilla chips. Top with sour cream and serve immediately. For the pico, I usually just chop up a couple Roma tomatoes, add some chopped cilantro, a little red onion and salt and pepper to taste. 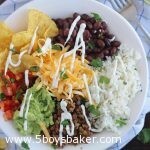 But I've also made these burrito bowls using bottled salsa (homemade or store bought). These bowls are delicious with either one. For the guacamole, store bought or homemade is fine. If I make my own, I just cut up two or three avocados, juice of half a lime, a little minced garlic and salt & pepper to taste. Sometimes I'll add a little chopped cilantro and chopped jalapeno if I have it. Then I just mash it up using a fork, I like to leave a few small chunks of avocado. 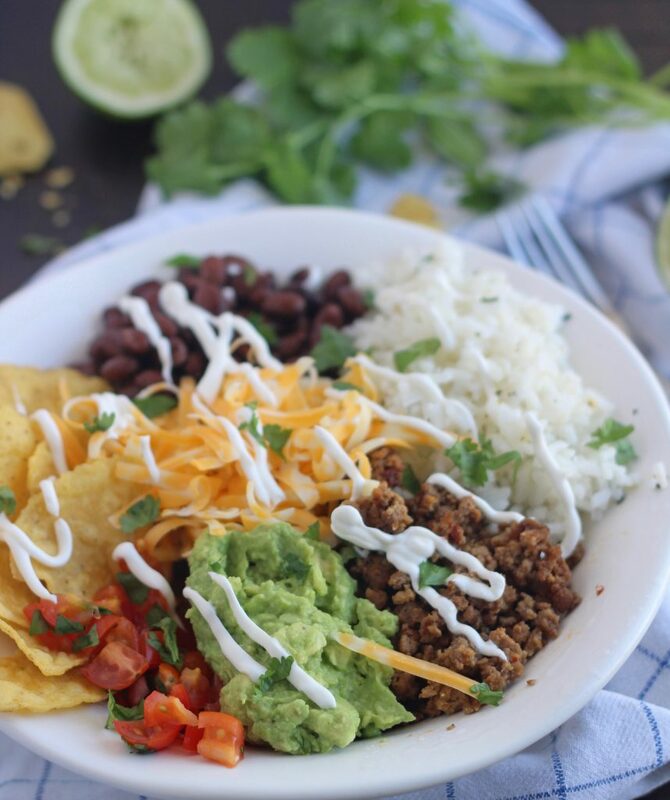 Once you've assembled the burrito bowls, stir it all together and dig in with a fork or sometimes I like to scoop spoonfuls of it onto a tortilla chip and eat it that way. We also love to drizzle homemade Cafe Rio Dressing on these. Hey Cat, thanks for letting me know these were a hit. I love hearing from readers!